“It’s something more than a movie… or maybe it’s something less.” so said Béla Tarr, introducing The Turin Horse at a film festival during the summer of 2011. It is something all right. set to the hurdy-gurdy drone of a composer Mihály Vig’s hypnosurging score, The Turin Horse is something close to music. Written by his great collaborator, novelist László Krasznahorkai, and co-credited to his life partner and longtime editor Ágnes Hranitzky, The Turin Horse is also tarr’s most fully achieved, challenging movie since his 1994 epic, Sátántangó—a death-haunted masterpiece of sensory under-load that opens with low-angle close-up of a horse trudging out of the mist towards the camera and, among other things, goes on to detail a way of life as brutish as any animal’s. The film’s title makes reference to a notorious event in the life of Friedrich Nietzsche. In 1889, while living in turin, Nietzsche was moved to tears by the spectacle of a cab horse beaten by its master—so deeply upset, some believe, that it triggered the philosopher’s descent into madness. In the movie that he says will be his last, Tarr proposes an afterlife for the horse. 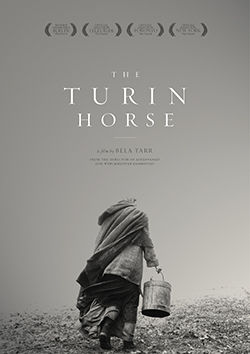 The Turin Horse devotes 146 minutes, over a mere 30 shots, to the daily routine of the elderly, partially paralyzed wagon master Ohlsdorfer (Janos Derzsi) and his grown, unnamed daughter (Erika Bok): each morning, the daughter rises first, helps her father dress, stumbles out to the well to fetch two buckets of water, and boils their meal—a morning shot of pálinka, an evening potato—as an apocalyptic wind outside their rough-hewn, dirt-floor cabin inexorably blows away the world. The wind in The Turin Horse feels even more relentless than the rain that fell throughout Sátántangó. (To watch Tarr’s movies is to understand why people refer to the weather as “the elements.”) Derzsi and Bok inhabit their roles as fully as does the horse (who like them gets an acting credit, identified as Risci). Not a word is spoken for the movie’s first 25 minutes, when finally the daughter informs her father that his potato is done: “It’s ready.” together, the pair eat in silence, using no utensil other than their hands—in his case, a single hand with which he pulverizes the hot potato before gingerly picking at it. Ten minutes later, Ohlsdorfer has his first line, a simple command: “Go to bed.” As in Chantal Akerman’s Jeanne Dielman, the domicile becomes a world and daily routine a ritual wherein minor variations have tremendous weight. The narrative could be a story out of the Bible, something the woman at one point reads aloud, word by painful word. Almost immediately, things begin to deteriorate. On the second day, the mare has to be beaten into action. On the third day, she stops eating. There are two other human interactions as nature devolves into a chaos of white light and blustering wind. one morning, a neighbor appears looking for pálinka; he treats father and daughter to a report on the end of the world. The wind is destroying the town; degenerates are in the ascendance. These are the latter days. this downbeat rant may be the most overtly Nietzschean thing about the movie. Ohlsdorfer dismisses it as “rubbish.” Two days later, a wagon filled with gypsies, en route to America, avail themselves of the well. Ohlsdorfer sends his daughter to chase them off. They invite her to join them and, bursting with life, drive away screaming “We own the water, we own the earth. Drop dead! Drop dead!” I think that’s an example of the movie’s sense of humor. On the fourth day, the well goes dry. Old Ohlsdorfer and his nameless daughter pack to leave. she pulls the cart, while he leads the horse. At lengthy they arrive at a deserted stone house—it is their own. (This is also a kind of joke.) The narrator explains: “For long minutes they stand motionless and, as the time passes, it becomes ever more obvious that whatever direction they set out in will be completely hopeless.” On the fifth day, the pálinka is almost gone and so is the light. “What is this darkness, father?” the woman asks. she has troublekeeping the oil lamp lit. abruptly, the storm ends, leaving nothing but nothingness. Dead silence: Father and daughter sit bowed over the table. Like the mare, she will not eat. There is no seventh day. There are to be sure some moments of startling beauty in this movie, as when Tarr fills the entire screen with a weathered wooden gate or a wrinkled, just-washed sheet. Mainly though, The Turin Horse is something—a thing, in fact—that you spend time with. The mind wanders and is brought back, newly focused by the object-like quality of the unfolding spectacle. In any case, Tarr’s great poem on the end of the world is truly a film for the ages. It can’t really be described; it’s an experience that has to be lived.